The Georgia Aquarium is investigating its most recent hire, a senior vice president caught on film allegedly abusing dolphins at the marine park where he was a trainer. The facility has hired an independent third party to conduct a forensic analysis of the video, which it calls "crudely edited" and "extremely questionable." The Atlanta aquarium's CEO, Mike Leven, says in a blog post that Barbero "is innocent unless proven guilty, and we have no intention of condemning an individual based on a single piece of unsubstantiated evidence." "If it were ever proven that a member of our team had abused an animal, he or she would be swiftly dismissed," Leven writes. At the same time, Barbero told The Dodo that he believes the footage, which shows a trainer hitting, kicking and jumping on dolphins at a park called Marineland Mallorca in Spain (where Barbero worked as a trainer until last Friday), has been doctored. "The video is shortened and edited, also they put a person who is not from the team of trainers in order to film the second part of the video (images from only one person) the voice is manipulated and edited. The video has been from two people who have been let go from the dolphinarium and have edited and filmed very poor quality, therefore it is not possible to properly identify the person at the high speed, trying to hit/punch the dolphins. It's what has occurred, it's all in an investigation process." 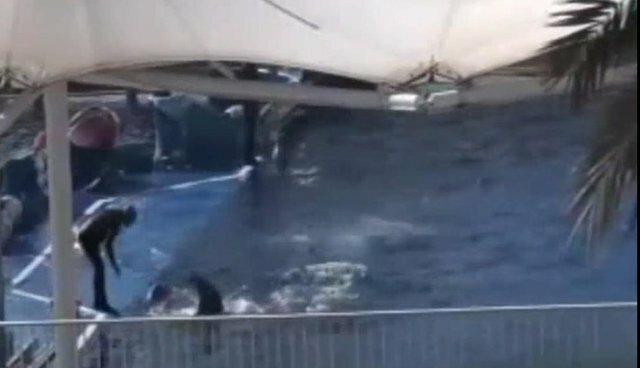 Jennifer Berengueras, of the animal advocacy group SOSdelfines, who released the video to the public on February 3, maintains that the footage is real. "If we need to show the original images to a judge we certainly will," she told The Dodo. Dolphin trainers, too, are turning on one of their own. The International Marine Animal Trainer Association (IMATA), of which Barbero is a member, awarded him the organization's People's Choice award in 1990. On February 4, 2015, IMATA's Board was made aware of a video that appears to show an individual or individuals yelling at, striking, and kicking dolphins ... We have yet to verify who the individuals are in the video nor been able to ascertain precisely what is taking place. However, we agree that the video is alarming and seems to indicate a trainer (or trainers) using unacceptable techniques. Erb said that once the individual's identity is confirmed, "that individual would not be able to remain or ever become an IMATA member." Marineland Mallorca's director previously told reporters that he was "shocked and embarrassed" by the footage. Marine mammal scientist Naomi Rose told The Dodo that the behavior was "abusive, pure and simple."